Gronk will play in the Super Bowl. New England Patriots tight end Rob Gronkowski called it a career this weekend after nine seasons in the NFL, including three Super Bowl titles, among them a Cinderella ending in February's win over the L.A. Rams. In a bruising position, Gronkowski endured three back surgeries, an ACL surgery, four arm surgeries, several concussions and injuries to his calf, quad and Achilles. He was one of the more humorous and likable players in the NFL despite playing for the Patriots, and his second half in Super Bowl LII nearly cost the Eagles a championship. On Monday, Gronkowski's former teammate, Eagles defensive end Chris Long, took to Instagram to a share picture of Gronk holding his son while the two were in New England. In Long's opinion, Gronkowski goes down as the best tight end the NFL has seen. The statement comes after a year in which Long's Eagles teammate, Zach Ertz, broke Jason Witten's receptions record for a single season. The San Francisco 49ers' George Kittle surpassed Gronkowski's previous tight end receiving record of 1,327 yards in a season, finishing with 1,377 in a Week 17 arms race with the Chiefs' Travis Kelce (1,336). 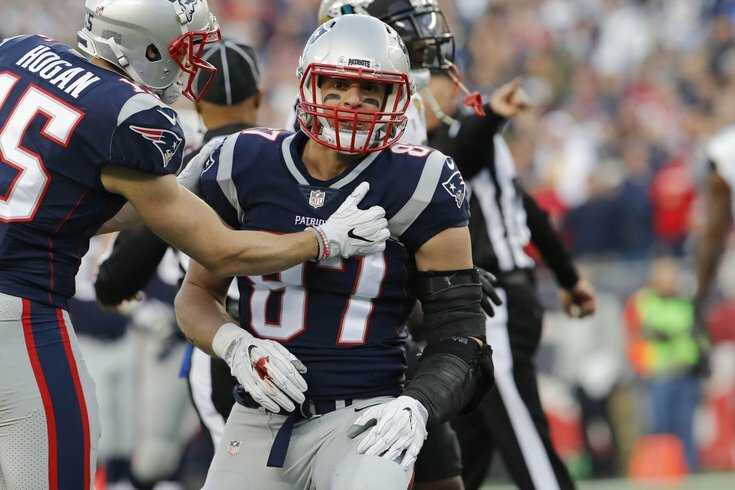 Any way you slice it, Gronkowski was the type of player whose physicality and skill as a receiver helped evolve his position into a priority for more and more NFL teams. The Eagles' selection of Dallas Goedert in last year's draft, even with Ertz on the roster, is as good an indication of that as any. It's also reassuring that Gronk didn't involuntarily spike Long's baby, which has always seemed like something in the realm of Gronk possibilities. Long's status with the Eagles heading into next season has yet to be determined. He remains under contract, but has mentioned the possibility of retiring or pursuing another team where he can expect an increase in playing time. Let's hope Gronk's decision doesn't tempt Long to hang up his cleats.